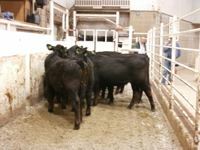 The Missouri Steer Feedout for winter-spring born calves began Nov. 4 for southwest Missouri participants. Eleven different owners brought 76 head to Joplin Regional Stockyards in Carthage for tagging, weighing, grading and pricing before going on the trailer for the trip to Gregory Feedlot, Tabor, Iowa. “In Iowa, those steers will join 81 steers from northern Missouri. They will be commingled, fed and managed alike until harvested next spring,” said Eldon Cole, livestock specialist with University of Missouri Extension. The Tri-County Steer Carcass Futurity group in southwest Iowa oversees the finishing phase and provides the participants the gain and carcass results for their cattle. An interesting and educational aspect of the feedout in southwest Missouri is the evaluation of the steers by different persons in the industry. The Southwest Missouri Cattlemen’s Association is a partner in this event. This year the panel for evaluation consisted of: Jackie Moore, Joplin Stockyards; Corbitt Wall, DV Auction; Rick Huffman, Missouri Department of Agriculture Market News; and Kris Callison, Fire Sweep Simmentals, Verona. Kris was asked to be on the panel since she did such a good job on the 2013 steer evaluation. “In recent years there has been an opportunity to do audience participation during the grading session. Last year Kris was one of the top three finishers in predicting how the steers would finish on gain, profit and carcass merit,” said Cole. This year’s southern Missouri entries were mostly born in February with a few as young as April. Their average weight was 684 lbs. 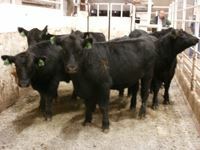 Rick Huffman placed an average price on them of $236.25. The range in price went from $220 to $285. Regarding the USDA grades placed on each calf, all calves were Large or Medium frames. A Large frame steer should reach his finished weight above 1250 pounds. A Medium frame should finish at 1100 up to 1250 pounds. The muscle scores were all 1s and 2s. According to Cole, the 1's are moderately thick as viewed from behind. The 2's are less thick and represent most of the British breeds and their crosses. One or two steers were almost a three on muscling that indicates a very narrow, almost dairy or Longhorn thickness. The 11 groups displayed a variety of breeds, types, colors that made for an educational evening. “The Steer Feedout gives both small and large cow-calf herds a chance to receive both a subjective and objective view of their herd’s genetics. Participation helps in genetic selection, marketing and management of feeder calves,” said Cole.